The name Hulk is, naturally, synonymous with quiet introspection and carefully developed plans of action – well, actually more so smashing. These days the world of Hulk (as opposed to Planet Hulk) seems a little more subdued, though. After the tragic death of Bruce Banner, his superhero nom-de-plume is carried on by fellow super-genius Amadeus Cho and his cousin Jennifer Walters, a brilliant lawyer who also goes by the appellation of She-Hulk. Whether pink and fleshy or rocking the perma-green skin (a look first established in Graphic Novel #18: Sensational She-Hulk), Jen has maintained a calmer edge to her rage-filled innards since her inception in Savage She-Hulk #1 (1980), at least compared to her gamma-irradiated cousin. In the aftermath of Civil War II, however, she's never been closer to losing control of her fearsome alter ego. Marvel’s second internal conflict tore down all of the trust painstakingly rebuilt in the superhero community after the original Civil War. The ideological war also claimed the lives of James “War Machine” Rhodes and (sort of) Tony Stark. For Jennifer Walters, though, a preemptive strike against Thanos saw the Mad Titan brutalize her, leaving She-Hulk clinging to the thin edge of life. Narrowly escaping her own fate, Jennifer Walters awoke from her coma only to discover that her cousin Bruce had been shot and killed by Hawkeye. Back in the Swing of Lawyering? Too often in the comic book realm, the effects of superhero cataclysms are swept under the rug. Hulk scribe Mariko Tamaki's choice to focus on Jen’s emotionally tenuous world after Civil War II lends the Earth-616-spanning event some extra weight. In addition, it sees a change in the once happy-go-lucky She-Hulk. Once always with a quip and a wink, Jen now uses her humor to cope with the shell-shock of her near-death experience and the crushing weight of losing Bruce. After struggling to make it out the door and surviving the crosstown subway trek, she arrives at the office for her first day back. Greeted by new surroundings but a few familiar faces, she discovers that, while it ain’t easy being green, looking normal comes with its own set of challenges – mostly living up to her own legacy. Still, it seems that diving into her work agrees with Jen, and she tries to help her peculiar first client, a woman named Brown (“pronounced Brew-n”) that’s fighting her sudden eviction. Even though getting back to work rights Jen’s ship for the day, unfortunately it won’t keep her hulking undercurrent at bay forever. Surviving a roomful of offbeat superhero clients – appropriate for a super-powered lawyer – seems like the perfect way to ease back into life for Jennifer Walters. Yet it’s only a matter of time before the events of the past come back to haunt her once again. As she heads back to her apartment, she’s confronted by a sociologically-trained author by the name of Florida “Flo” Jones, who asks Jen to participate in her research for a book about trauma, something Jen could write on her own. Fleeing from the intrusive writer, Jen begins to understand that there's no way to escape the residual, crushing pain of her life-altering experiences. As she rides the elevator to her flat, the green rage begins to surge, each floor counting up to her total loss-of-control. Barely making it through the door, she curls on the floor of her apartment, regaining her cool thanks in part to a soothing cooking video, but not before an innocent elevator and table top suffered a small fraction of her wrath. Jennifer Walters may not be green and grinning as widely anymore, but Hulk #1 is far from a depressing entry into her saga. It showcases the once (and still) powerful She-Hulk at her most vulnerable and human point, a fragile state which anyone who’s experienced an earthshaking loss can identify with. The first issue starts slow, building momentum and digging deeper into Jen’s life. But it's also filled with life-affirming moments, undercut with Jen's trademark snarky wit (mostly internal monologue), and to dangles some tantalizing threads in front of readers’ faces. 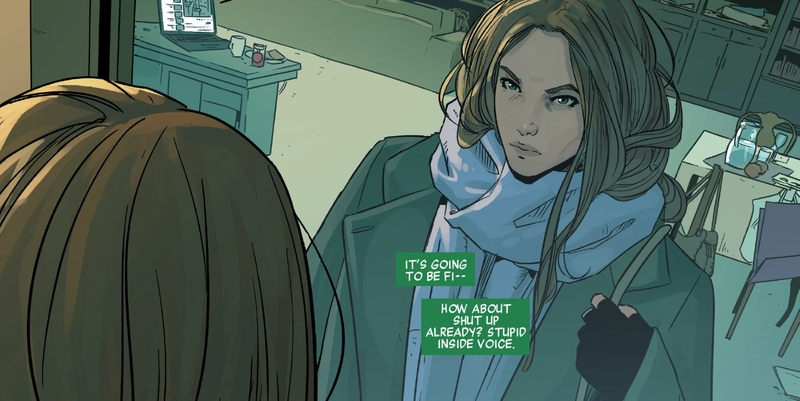 In addition to being crisply written by Mariko Tamaki and beautifully drawn by Nico Leon (with sharp colors from Matt Milla), the first chapter earns the name Hulk: Jen’s current status parallels her gone but not forgotten cousin and her green-streak illustrates the surge of emotions which even we non-superpowered types are nearly overwhelmed by, from time to time. Hulk shows us that, even inside gifted attorney Jennifer Walters – someone who has finely-tuned her Emerald Giant-side – a full fledged monster still lurks much closer to the surface than she (and we) want to admit. Next: Does Tony Stark Evolve After Civil War 2? Hulk #1 is currently available online and in stores.